Home » » Instagram Bigboy, Hushpuppi's Halloween Costume Stirs Laughter On Social Media. Instagram Bigboy, Hushpuppi's Halloween Costume Stirs Laughter On Social Media. Popular Instagram millionaire big boy, Ray Hushpuppi, who is known for spending lavishly and patronising expensive fashion brands and flaunting the photos on social media, has joined millions of others abroad to celebrate Halloween. The controversial big boy supposedly dressed as Beyonce for the occasion. He wore a curly wig and a bathrobe that was shiny and girlish in a way. 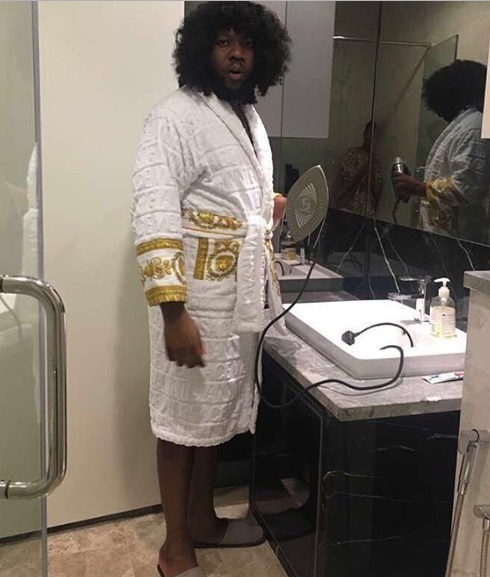 Right in the bathroom, Hushpuppi who posed with an iron in his hand, took to Instagram to post the hilarious photo of him with a wig on his head. He captioned the photo: "Happy Halloween #Beyoncé"
This picture which has gone viral is stirring up laughter among a lot of people.